+ Can I copy the DVDs that Videoscape supplies? When companies such as Videoscape Productions transfers your valuable memories to DVD, the resulting DVD is never copy-protected. You can make as many copies as you like, or if you prefer, we can do the copying for you. However, in terms of the menus used or any additional content such as titles and so forth, the copyright for these would remain with whoever did the transfer. Some businesses use this technicality to limit your ability to copy your own DVDs. We do not think this is fair and do not implement any copy protection on our DVDs. We believe that the transfer we do for you, from your images, belongs to you to copy as you like. While we do not grant unconditional rights to any additional content, we do permit you to make copies. Our business is safeguarding and restoring your memories. Not restricting them. + Why shouldn't I just buy a cheap USB video-to-dvd device and do it myself? People often ask about the plethora of cheap usb devices for transferring video to DVD. They are available everywhere and can cost as little as $40 - if you shop around. Are they worth investing in? Should you buy one of those and do all your transfers yourself? Why wouldn’t you? There are a number of very important factors to consider if you are thinking of getting your old video onto DVD. If you don’t think carefully and make the right decision, the chances are that you will regret it. Image stabilization using Line Time Base Correction (LTBC) What’s LTBC? We use commercial quality AG series video players as the source for video copies. These units are about 7 times larger than your domestic VHS and probably about 11 times heavier. They were designed for the pinnacle in playback quality. You must understand that copying video is not like copying a CD or DVD. Video (VHS, BETA, Video8) all play back using analogue signals. These were designed to degrade on play - as a means of minimizing copyright breaches. So to get a good copy, you need the absolute best quality player. Most domestic players are designed to produce watchable results, and that’s all. It’s not going to look like the picture on the box. The smilin’ girl, the amazing HD 3D effect - the reality will be messy to connect, complicated to make work and very average in terms of results. Videotape does not age well. There is no such thing as ’antique’ videotape. With the passing of time there is damage from moisture, dust, magnetic fields; tape edges can easily be creased or bent; the very coating on the tapes oxidizes leaving you with unwatchable garbage. No, time is not kind to videotape. If we transfer your tape, our equipment can help to reduce the impact of these problems. We can also clean your tape which can help considerably with oxidization. When you do it yourself, you run the risk not only of a very poor copy but of damaging each subsequent tape due to clogged video heads, damaged rollers and so forth. 5. We are your Round Tuit. It’s the old story - you’ll do it when you get around to it! We are your round tuit. Even with the best intentions, most people will never actually copy their precious videos onto DVD. It takes time and it takes dedication. Usually, life is far too busy to spare the time to transfer your video memories onto DVD. Even when your nephew Shane offers to do it, you end up waiting months, years - or forever - because he’s got distracted with the iPhone or the iPad or the iHelicopter. If you have videotape that contains something that you want copied to DVD, then it is worth getting it done right, with a minimum of fuss. If it’s worth keeping then it’s worth getting someone to do it right. + Can you copy my mother's singing from cassette to CD? Certainly. We can also enhance the recording - reducing hiss and other artifacts of the recording process. + Can you put my picture on DVD labels? + Copyright - What are the responsibilities? Copyright is a complex area of law and varies from country to country, however since Videoscape Productions operates mostly within Australia for Australian clients we are mostly bound by Australian law. If you recorded it from free-to-air TV or cable TV then no-one is allowed to copy that recording. If you bought a pre-recorded video tape then under certain circumstances, you can copy it to a different medium (e.g. DVD) however only you may legally do that - no one else. We are not even allowed to rent you the equipment to do so. If you have a recording made for you (e.g. video of a wedding) then unless your contract specifies otherwise, YOU own the copyright. Of course, there is a lot more to copyright and licensing than this but it will give you an idea. When you sign an agreement with Videoscape Productions to transfer images or video or to create some piece of media, part of that agreement consists of your assurance that you do possess all of the appropriate rights. Where desired, we can organise the appropriate licenses to allow your choice of music but we also have an extremely large range of licence free resources that create mood and evoke emotion without evoking a higher price tag. We will always work with you to deliver that special experience that you deserve. + My camera wont work with my MAC - can you help? Yes, we can. We have Macs (and know their value) but also have access to other computers running Windows XP and Windows 7. We can almost alway transfer your memories from your camera onto DVD. + I have a High Definition camera - is that a problem? At the moment we do not produce BLU-RAY disks which effectively means that the DVD you receive will be standard definition. We can still backup your high-definition video files however so that they can be burnt to BLU-RAY disk at a later time if you so desire. + I can't get the video from my hard-disk camera onto DVD - can you help? Most certainly we can. We can produce a playable DVD for you or alternatively, we can simply backup your video onto DVDs in their native format so that you can get them back in the future - should anything happen to your camera. + Do I need to backup the images/video on my camera? Look at it like this : if you put all your eggs in one basket then you are asking for trouble. 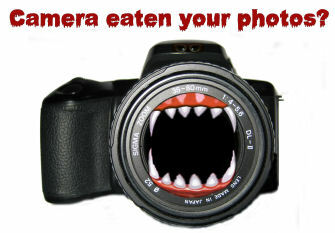 What happens if the camera is lost or damaged? Where will your valuable images and video be then? What if you just fill it up? We can backup your precious memories in their native format to DVDs so that you can always get them back should something happen to your camera. And we can provide you with DVDs to play in your DVD player too!